Israel's enemies assert that its destruction is inevitable, and those who would destroy her are cheered on by many in the West. At the same time, Western mainstream media, particularly in Europe but also major media outlets in America, do puff pieces on Israel's genocidal adversaries, slant the news to conform to her enemies' propaganda, and support the delegimitization of the Jewish state. The Gaza War, and the response to it across the world, have underscored the threats to the state's survival, Israel's often maladaptive and self-defeating reactions, and what is required of the state to counter those who challenge her existence. There are obviously those eager for Israel's demise. Since the Jewish state's creation, the Arab world has wanted it to disappear and this has not changed. Promotion of Arab supremacism, which accords little if any rights to non-Muslim or non-Arab groups in what the Arabs deem their proper domain, extends beyond Israel to abuse of Christians throughout that world as well as of Muslim but non-Arab peoples such as the Kurds of Iraq and Syria, the Muslim blacks of Darfur, the Berbers of Algeria. That abuse has repeatedly reached the level of genocidal campaigns, as reflected not only in the slaughter in Darfur, but also in the murder of some two hundred thousand Kurds in Iraq and some two million Christian and animist blacks in southern Sudan. In terms of genocidal incitement against minority populations, none is as graphic and incessant as that purveyed in Arab media, mosques and schools - even in countries with which Israel is formally at peace - against the Jews and Israel. The existence of Israel is seen as an intolerable distortion of the proper order of things, according to which Jews should either be dead or, at best, subjugated members of society existing at the sufferance of their Arab betters. In recent decades, enlistment in this genocidal hatred has widened to encompass many in the broader Muslim world. Obviously, the Iranian Revolution of 1979, the installation of a clerical regime that has sought to expand its influence by taking the lead in promoting Israel's destruction, has presented the Jewish state with a grave new threat. In terms of broader enmity in the Muslim world, however, the greatest factor has been aggressive Saudi export of Wahhabi fundamentalism, its preaching of virulent Jew-hatred (and hatred of other non-Muslims), and its ever increasing influence not only in once tolerant Islamic nations but also in Muslim communities in Europe, the Americas and elsewhere. To the degree that some in the Arab world, such as Saudi Arabia and Egypt, feel threatened by Iran, its alliance with Syria, and their protege organizations such as Hezbollah in Lebanon and Hamas in the Palestinian territories, those states have interests which converge with Israel's. But this offers only very limited relief from the surrounding hostility Israel faces. Noteworthy in this regard is that Saudi Arabia and Egypt, as well as Jordan, continue to promote Jew-hatred in their media and schools, the Saudis continue to finance many Islamist groups even as they fear and sanction others, and any constraint on Saudi hostility towards Israel inspired by fear of Iran would certainly be reversed were the Iranian threat to "moderate" Arab regimes to disappear. In terms of Israel's Palestinian Arab neighbors, the PLO, and its dominant party Fatah, under Arafat and since his death, have been and continue to be committed to Israel's ultimate destruction. So, too, of course, are Hamas and the other Islamist parties. Whatever true moderates exist among the Palestinians have no political voice or influence. In addition to the animosity of the Arab world, Israel is faced with much hostile sentiment in Europe, fed by traditional anti-Semitism, by leftist anti-Americanism and association of Israel with America, by perverse, ahistorical leftist twisting of the Israeli-Arab conflict into Israeli colonialists brutalizing the supposedly indigenous population, and by the European media being house organs for anti-Israel bigotry of all these pedigrees. The growing threat of radical Islam to European states, particularly as manifested within those states' immigrant Muslim populations, has in some quarters led to greater sympathy with Israel's predicament. But elsewhere, especially among the cadres of the Left, which include most of the media, this threat has had the opposite impact and inspired a wishful thinking that all would be well, Islamist hostility would be appeased, if only Israel would make sufficient amends or simply disappear. Nor is America immune to these distortions of reality. As the Muslim population in the United States has grown, and as it has become more radicalized, largely by Saudi promotion of Wahhabi extremism, an alliance has emerged between the far Left in this country and the forces of genocidal Islamism. Their recent joint demonstrations against Israel have included explicitly anti-Semitic "cheers," such as calls for "Jews to the ovens." Regrettably, even less extreme elements of the Left, such as some within the so-called "liberal" churches, have signed on as fellow travelers with this alliance for Israel's defamation, delegitimization and ultimate demise. Israel is also attacked, and its very existence challenged, in the United Nations, an institution that has largely become the monster it was created to fight. The UN Human Rights Council, whose present members include such paragons of domestic civil rights as Cuba, Saudi Arabia, China, Malaysia and Bangladesh, routinely excoriates Israel in terms that single out the Jewish national liberation movement as uniquely illegitimate. The UNWRA, which for six decades has been responsible for Palestinian refugees and their families, promotes genocide under the flag of the UN. UNWRA schools teach the glories of suicide bombing and martyrdom in the effort to destroy Israel, employ members of terrorist organizations on its staff, including as teachers, and serve as a conduit for recruiting children into terrorist cadres. In addition to all these challenges to her existence, Israel faces a domestic enemy. This extends beyond those within the Israeli Arab community who identify with Israel's external enemies. In the face of living under constant siege, some among Israel's Jewish citizens, particularly within the nation's elites, choose to distance themselves from the national predicament. They choose to find fault with the state and side with her defamers and would-be destroyers, embracing her adversaries' indictments. They urge, at a minimum, territorial and other concessions to placate Israel's enemies, even at the cost of rendering the state more vulnerable, and some even argue for the dissolution of the state to mollify her enemies. Predictably, they cast their doing so not as a desire to separate themselves from their embattled fellow citizens or to appease those who would annihilate them but as embracing a higher morality. The same hypocrisy is seen among many Diaspora Jews, who likewise endorse the indictments of those who would destroy Israel, join in defamation and delegitimization of the state, and do so while averring only the highest ethical motives. A list of American and European Jews of this ilk would fill many pages. The widespread and implacable hatred faced by Israel is seen by some, and often characterized in the media, as virtually insurmountable. So too, according to various voices in the media, is the translation of this hatred into physical attack. If Israel has been able to prevail in the past in conventional wars, the present and growing challenge of unconventional assault - at one extreme, with weapons of mass destruction, most threateningly an Iranian nuclear arsenal; at the other extreme, incessant terror entailing rocket and mortar attacks from terrorist forces imbedded within dense civilian populations - may be, it is suggested, beyond solution. In addition, Israel also confronts the challenge not only of the enmity of its neighbors but of their fertility as well. Palestinian population growth ranks among the highest in the world, fertility among Arab citizens of Israel is also high, and together, it is often argued, Israel faces a demographic challenge that it has no means of countering while preserving itself as both the Jewish state and a democracy. But despite all these various, serious challenges, Israel's fate remains largely in its own hands. Israel has peace agreements with Egypt and Jordan because it convinced both states that, however much its leaders or its citizens might like to see Israel gone, the price of pursuing that goal is prohibitive. There is no peace with Syria, but Syria has long refrained from direct hostile action against Israel for the same reason of not wanting to pay the likely price. Some argue that Islamist states and parties cannot be dissuaded by such calculations because they are driven by religious zeal and are prepared to pay any price, and imply that such adversaries therefore cannot be defeated. But this thesis has not been tested. Such regimes are immune neither to annihilation- that is, a weakening to the point where others in their societies are able to seize control from them - nor to a battering to the extent that, even if they retain control, they are rendered unable to act, at least for an extended time, on their genocidal agenda. The biggest challenge to Israel is an Iran close to achieving nuclear arms, and - while ending Iran's nuclear program by other means would be preferable - even this challenge is not without military answers. In terms of smaller players such as Iranian proxies Hezbollah and Hamas, military dissuasion had hardly been tried prior to the current war in Gaza. Israel, under Ehud Barak, left southern Lebanon in 2000 without assuring that Hezbollah would not fill the void there. Barak and many other Israelis were convinced that, in any case, Hezbollah would not pursue the war across the border. Despite many subsequent episodes of Hezbollah cross-border terror, including the murder of Israeli soldiers and civilians, Israel downplayed the threat and offered no serious response. When it did respond, in 2006, it was unprepared to do so. It then ended its campaign and acquiesced to creation of a UN force in southern Lebanon that has done nothing, despite its mandate, to prevent Hezbollah from reconstituting and greatly expanding its rocket and missile arsenal and from reestablishing itself in areas which are supposed to be prohibited to it. Some in Israel now argue that the nation nevertheless inflicted enough damage in 2006 that Hezbollah is hesitant to restart hostilities. But it is far from clear whether Hezbollah is cowed or simply biding its time or awaiting marching orders from Tehran. Vis-a-vis Gaza, many Israeli leaders, most notably its present prime minister, deluded themselves into believing that Israel's full evacuation of its communities and military from the territory in 2005 would be followed by quiet and would be a step towards a more general peace. The evacuation was followed instead by more rocket and mortar fire targeting Israeli towns and villages, and this assault dramatically increased when Hamas seized control of Gaza in 2007. Israel's abandonment of the Philadelphi corridor in the context of its general withdrawal opened the way to large-scale smuggling of ever more powerful rockets and missiles and other armaments into Gaza, yet Israel barely responded to either the rocket and mortar attacks or the smuggling. Now it has responded and has done so in an impressive manner. It has not destroyed Hamas, but it is far from clear that the organization's destruction at this point is desirable. Of course, the impact of weakening the organization has yet to be seen. If Hamas continues to fire its rockets, mortars and missiles, Israel can resume its attack and weaken it further. Israel's most significant mistake may be not retaking the Philadelphi corridor, as it is highly unlikely that Egypt is prepared to stop weapons smuggling into Gaza or that any role given to third parties such as European observers would do the job. But if Israel will respond to further smuggling by seizing the corridor, then this issue too can be addressed. Israel should adopt a zero tolerance policy with regard both to smuggling of weaponry into Gaza and attacks from Gaza. If it has the will to do so, it certainly has the means to enforce such a policy. Similarly, while Hezbollah offers greater challenges, renewed hostilities on the Lebanese front too are manageable, if Israel has the will to address them effectively. In fact, what has exacerbated actual problems, and created an impression of some of those problems being intractable, has largely been Israel's failure over the last fifteen years to address the challenges it faces. Too many Israelis became psychologically exhausted by the siege and deluded themselves into thinking they could end it if they only made sufficient concessions. 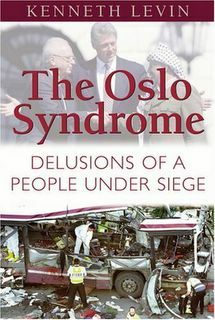 In the Oslo debacle, they brought people dedicated to their destruction into the territories as "peace partners," armed them, closed their eyes to their "peace partners'" engagement in genocidal incitement and vicious, wholesale terror, and convinced themselves that their dead were "sacrifices for peace." Only when they pushed for an "end of conflict" final agreement, and Arafat, despite Israel's offering to return virtually to the pre-1967 ceasefire lines, launched a full-scale terror war, did Israel begin to wake from its delusions. Yet, while it largely pacified the West Bank, it still repeated self-destructive policies in its tolerance of terror from Lebanon and from Gaza. In addition, Israeli policies and rhetoric concerning the West Bank likewise continue to reflect dangerous delusions. A national goal of reaching an arrangement in the West Bank that entails Israel's retaining defensible borders, including the areas where almost all the so-called "settlers" live, while separating itself from the vast majority of Palestinians, would be understandable and reasonable. What is neither understandable nor reasonable is the belief that Israel can forego defensible borders and can hand ceded areas to Mahmoud Abbas's PA and have peace. Nor is there merit to alarmist arguments that Israel must play the supplicant and hand the territories to whomever will take them, however hostile the recipient, because of the demographic challenges to the state; that it moreover must forego retaining defensible borders because doing so would also mean adding Arab citizens in numbers that would undermine the state demographically. The latter is factually untrue; Israel could pursue defensible lines while still separating itself from the vast majority of Palestinian Arabs. Most of the areas it needs to retain are, in fact, sparsely populated. And it need not be the supplicant to find a recipient, however hostile, to take what it would cede. Various models have been presented by sensible, strategically astute, Israeli thinkers of ways to move forward to ultimate separation from areas of dense Palestinian Arab population without compromising the security of the state. Self-defeating Israeli actions over the last two decades have entailed more than the grave errors in policy decisions. They have gone beyond Israel's embrace of "peace partners" who had no interest in peace and the adoption of delusions that, despite what the other side says and does, sufficient concessions and self-reform and demonstrations of good will would inevitably win relief from ongoing besiegement. Likewise of profound negative consequence has been Israel's failure to make its case forcefully to the world. This too has been largely motivated by the desire to propitiate its enemies, to see salvation in concessions and self-reform and to ignore the nature and the dimensions of the threat. And so the nation's leaders, and its foreign service bureaucrats, have failed to point out and protest strongly Palestinian and wider Arab indoctrination, in media, mosques, and schools, to Jew-hatred and genocide. They have failed to emphasize, as they should indefatigably, in every forum in which the nature of the conflict is distorted and Israel is pressed for concessions, that there can be no peace as long as the Palestinian Authority and Hamas and virtually every other Palestinian group and the Arab world more broadly aspire to Israel's ultimate destruction and promote this goal among their people and educate their young to it. The government, including the foreign service, are too often mute when confronted with the most bigoted and unconscionable anti-Israel libels, distortions of reality, by Arab spokespeople or media factotums or others, even though their silence in the face of defamatory lies, or their weak and almost apologetic rebuttals, serve only to lend credence to the defamations and legitimacy to their purveyors. The repeated emphasis by Israeli spokespeople during the Gaza War of the provocations that triggered Israel's actions, of the months and years of rocket and mortar assault from Gaza on Israeli towns and villages, the repeated assertion of the obvious point that no other sovereign state would tolerate such assault or refrain from responding forcefully, has been a step forward from past performance. Likewise, the response to misinformation and disinformation during the war - the shift, for example, from knee-jerk apologies in the face of claims of indiscriminate force to investigation of the claims and a fact-based answer supported by video and other evidence - is certainly an improvement on what has been the typical handling of such situations during previous hostilities. But there is still far to go in Israel's responsibly making its case. It has yet to publicly challenge, with a force appropriate to the animus of Israel's accusers, the routine slanderous assaults by Palestinian and other Arab leaders, by NGO's, by UN officials, by various political figures on the world stage, and by so many in the media. To argue that Israel's fate is essentially in her own hands, in the hands of her people, is hardly to make light of the problems Israel faces. But as long as the great majority of Israelis do not succumb to the bigotry of their enemies and their enemies' fellow travelers, domestic and worldwide, as long as they remain steadfast in the conviction of the rightness of their cause - a rightness evident to any informed and fairminded observer - then, just as they have overcome dire threats in the past and indeed built a society whose achievements have been far beyond the wildest dreams of the nation's founders, the odds are well in their favor of continuing to meet whatever challenges confront them.